This research examines the influence of leaders’ mindfulness on employee well-being and performance. We hypothesized that supervisors’ trait mindfulness is positively associated with different facets of employee well-being, such as job satisfaction and need satisfaction, and different dimensions of employee performance, such as in-role performance and organizational citizenship behaviors. 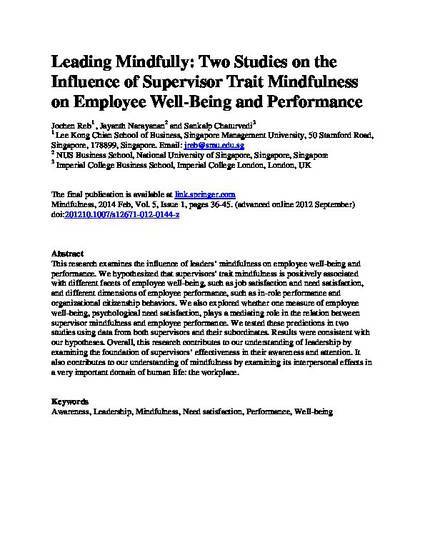 We also explored whether one measure of employee well-being, psychological need satisfaction, plays a mediating role in the relation between supervisor mindfulness and employee performance. We tested these predictions in two studies using data from both supervisors and their subordinates. Results were consistent with our hypotheses. Overall, this research contributes to our understanding of leadership by examining the foundation of supervisors’ effectiveness in their awareness and attention. It also contributes to our understanding of mindfulness by examining its interpersonal effects in a very important domain of human life: the workplace.